Ranjith Udawatta, associate professor in Soil, Environmental and Atmospheric Sciences, demonstrates … Expand ▸Ranjith Udawatta, associate professor in Soil, Environmental and Atmospheric Sciences, demonstrates riparian buffer / water quality runoff collection equipment at the Horticulture and Agroforestry Research Center (HARC) in New Franklin, Mo. An innovative program designed to train the next generation of agroforestry practitioners earned a national award from the USDA. The project, titled Increasing Agroforestry Adoption and Networking in the Midwest through Targeted Professional Development was named the 2012 Paula Ford Professional Development Program Proposal of the Year. The North Central region selects the project that best exemplifies Ford’s contributions and passion for evaluation, professional development and science-based research. The project is a joint effort among five Midwestern states — Nebraska, Missouri, Minnesota, Iowa and Wisconsin — that compose the Mid-America Agroforestry Working Group (MAAWG). The integrated practices of agroforestry include forest farming, alley cropping, silvopasture, upland and riparian forest buffers and windbreaks. 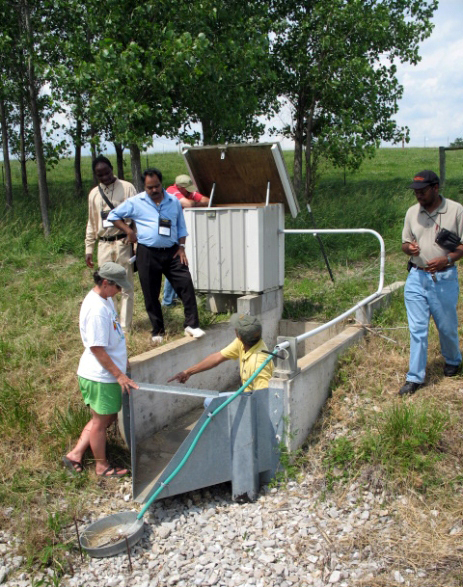 The practices are tailored to fit the unique needs of individual landowners and their farms, and offer multiple benefits allowing landowners to diversify markets and farm income; improve soil, water and air quality; sequester carbon; mitigate and adapt to climate change; enhance and conserve land and water habitats for fish and wildlife; and increase biodiversity while sustaining land resources for generations to come. 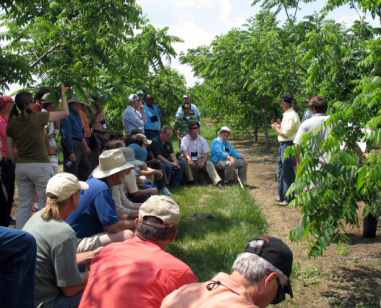 Mark Coggeshall, research assistant professor of forestry at MU, discusses black walnut hybrid collection at HARC during North American Agroforestry Conference Field Tour. This Academy is designed precisely to address this issue by working across the five-state region to train the trainers, such as NRCS staff, extension agents, university educators, certified crop advisors and representatives of agricultural groups, such as the Missouri Farmers Union. The first Academy will take place August 5-9 in Columbia. About 30 participants will engage in intensive classroom work, visit area farms employing agroforestry practices, such as Ozark Forest Mushrooms and Shepherd Farms, and design an agroforestry improvement plan for a local land owner. Gold said among most Missouri agricultural fields, such as corn, soybeans or beef, an extensive knowledge network exists to support farmers. 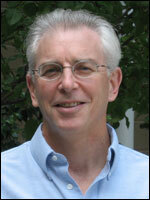 His team aims to create such a network for agroforestry to share information across industries and disciplines. Agroforestry practices haven’t been a part of the National Agricultural Statistics Service agricultural census, so little data exists in the Midwest. By training trainers, the Academy will create a network that will both fill knowledge gaps and provide data on what’s happening in the field. Several colleagues from CAFNR’s Center for Agroforestry contributed to the project including Mihaela Cernusca, Shibu Jose, Larry Godsey and Dusty Walter, in association with a large group of colleagues affiliated with MAAWG.